Promoting and developing Karate as a martial art and sport throughout the province. Thank you to everyone who traveled to Martinsville to support SKA’s 2017 Spring Tournament. You can find the results below and a picture of Doug Parker with his students below. Doug Parker with conversing his students at the national tournament. Dylan Dickson, Danya Dickson, Ayumi Sinclair and Nancy Graham-Fiss. 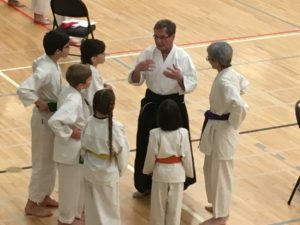 The goal of the Saskatchewan Karate Association is to promote and facilitate the development of traditional karate as a Martial Art and as a Sport throughout the Province by encouraging participation from as diverse an area and population as is possible; standardizing and supervising the quality of karate instruction throughout the province, instruction of “karate-do” (the karate way); examination and registration of student ranking and other technical qualifications; sponsoring seminars and other events; developing qualified coaches, instructors and officials; cooperating with organizations for development of karate; such other activities as may assist in achieving the above goal.